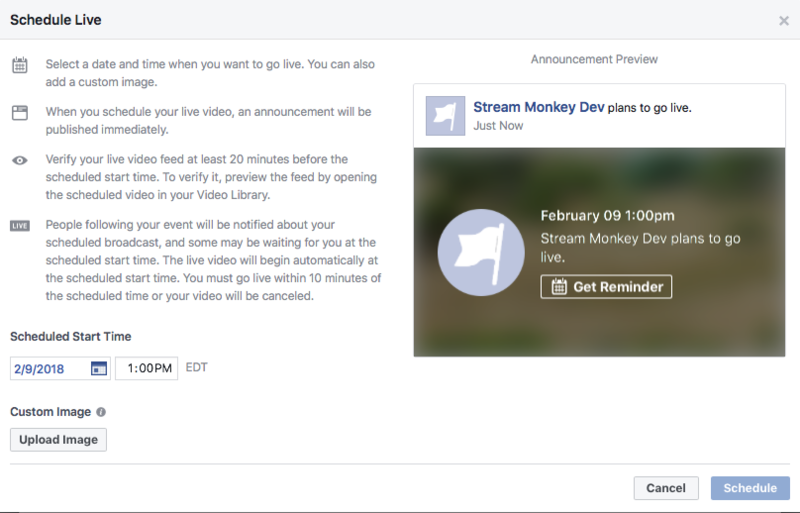 Streaming to Facebook Live is extremely simple when using Stream Monkey's live transcoding service. To get started, login to the Dashboard and head over to "Live Streams". 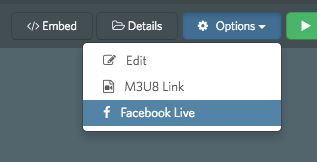 Next to your transcoder stream, click "Options" and then "Facebook Live"
There are two methods to stream through Facebook Live. Create a new post or Choose a Scheduled Post. This article will explain the second. 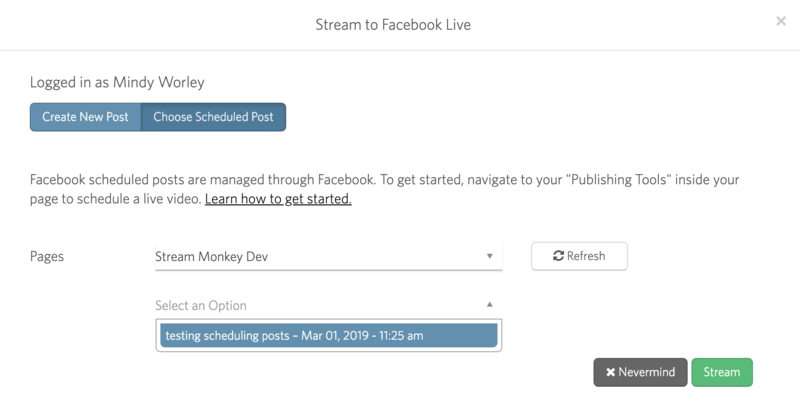 Choosing a scheduled post requires a little setup on Facebook's side before you can begin. Let's walk through how to set up a scheduled post inside Facebook. 1. Login to Facebook and visit your page or event's page. As an administrator of the page or event you will see an area for "Publishing Tools" in the navigation. 2. Navigate to "Video Library" in your Publishing Tools to set up a Facebook Live video. 3. 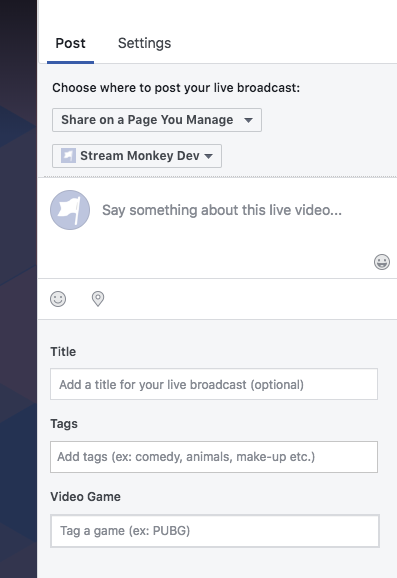 Choose "Live" at the top right to go through the Facebook Live prompts to begin your scheduled post setup. 4. On the next screen, Facebook will give you all your streaming details. You don't need to worry about that; Stream Monkey handles this for you. To the right of that screen, you'll be prompted to enter a Facebook status, add a title, and optional video tags. 5. Now that you have all your information filled in, there's only one remaining step: schedule the time for the post to go live. Hit the schedule button at the bottom of the screen. 6. Schedule a start time and add a custom pre-start image. Scheduling a video will post to your FB page and let your followers know that you have an upcoming live event so they can tune in. 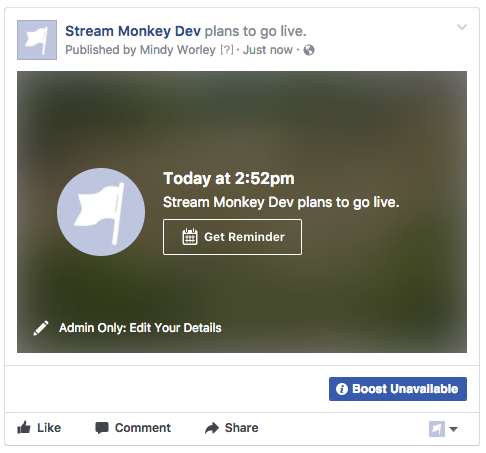 When it comes time for your scheduled stream to begin, simply go into the Dashboard and hit the Facebook Live button. Hit Create New Post and select Choose Scheduled Post. Your scheduled stream should show up in the drop down menu. Please be aware that your scheduled stream will only show up in this drop down menu within a certain time of your stream starting. You can also hit the Refresh button if you don't see it. Select your stream and hit Create. Your stream will be ready to fire on schedule!